It's Flashback Friday, and time to pull something out of the archives that I think could stand a little more exposure. If you'd like to join the fun, clink on the image above to visit Michael d'Agonstino's A Life Examined blog and see how! Okay, yeah, I know it's almost Saturday some places (Hi, Jemima!). The kid was off school this week and I got confused...But here it is at last, from June 2016. The body washed gently against the shore, bumping up against the rocks and washing away, only to return with the next wave. The the blonde hair floated about the head like a halo. 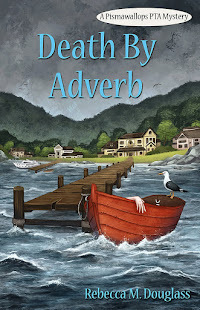 Marsha Harrigan, police detective, watched the corpse for a minute, and reflected that her peaceful lakeside vacation had just come to a crashing end. With great reluctance she pulled out her cell phone, looked up the number of the local police, and dialed. She would have liked to just report the body and let the police take over, and go on vacationing. Except that Lilacs-on-Lakeshore was in her jurisdiction, and she knew the police chief. Alex Tormentino knew his limits, and he was very good at handling petty thievery, speeding, and excessively noisy parties. He had never, to her knowledge, handled a murder and he would want an expert at his side. Marsha was an expert, and she was on the spot. The boss would order her to cut short her vacation and take the case. It worked about that way. 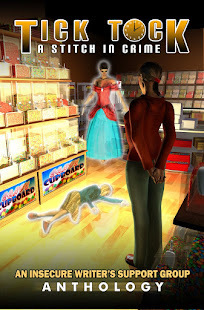 Tormentino was on the spot within 15 minutes, studied the floating corpse for a few seconds, and turned to Marsha, who already had her orders. He gave the appropriate orders to his subordinates, then said, “Oh, I know who she is.” His tone said that there was a tale to be told. Marsha listened. “Her name is Annalynda Smith.” Marsha raised an eyebrow, and Tormentino shrugged. “I know. Sounds like a fake. Probably was. She runs—ran—the local beauty salon.” His eyes drifted toward the dripping body that had been pulled from the lake. “For how long?” Marsha distracted him. Tormentino was looking pale. She would have to examine the body, but there was no reason for the poor police chief to make himself sick. Marsha sent Tormentino off to see who had seen Ms. Smith last, and when, while she studied the body. The blonde wore an outfit that explained the complaints of men and women alike, and there were suspicious marks on her neck. “Looks like she aggravated one person too many,” Marsha muttered to herself. Then, to the waiting deputies and EMT crew, “Take her down to the City and let the medical examiner get started.” No sense in being careless. You never knew what might be discovered with a proper autopsy. Meanwhile, she would do a close inspection of the shore to see what else might have washed up. Marsha made a silent note that either the woman was misinformed or was being excessively clever, and looked at another citizen. “Mr. Collins says she flirted with him right in front of his wife, and he had to sleep on the couch for a week. That gave him such a stiff neck he hasn’t been able to work.” Tormentino nodded at another man. “He lives next door to her. He’s had to move into the hotel because the chemicals from her salon trigger his allergies.” He went on, explaining why each of the persons present might wish the dead woman ill. The townspeople looked at each other with new suspicion. “You mean someone took her out in a boat and shot her?” Another guess. “I thought she was being dramatic, some silly game, and then she toppled over. Right overboard.” He was sweating. “I searched for hours. But I couldn’t find her in the dark, and when it started to get light, I panicked. I knew you’d all think I killed her! So I just—left. ” He began to cry, and Marsha let the others lead him out. When they were gone, she turned to Tormentino. “You can decide if you want to press charges. I’m on vacation.” As she left, she fingered the broken necklace she’d found on the beach. No one could ever know who had broken it.